An in-depth report on the causes, diagnosis, treatment, and prevention of ear infections. is an inflammation caused by bacteria that travel to the middle ear from fluid trapped in the Eustachian tube. Children with AOM exhibit signs of an ear infection including pain, fever, and tugging at the ear. refers to fluid that accumulates in the middle ear without obvious signs of infection. OME usually produces no symptoms. But some children will have difficulty hearing or complain of "plugged up" ears. Other types of ear-related infections include external ear infections (otitis externa) such as swimmer's ear, or masteoiditis, whis is usually a complication of severe AOM. Preventing colds and influenza ("flu") is the best way to prevent ear infections. Make sure children wash their hands frequently and receive an influenza vaccine annually and the recommended series of pneumococcal vaccinations. No one should smoke around children, since exposure to second-hand tobacco smoke can increase the risk for middle ear infections. Breastfeeding for a baby's first 6 months can help protect against ear infections. Antibiotics are effective treatment for acute otitis media. However, many ear infections resolve without antibiotic treatment. For most children with AOM, doctors recommend waiting 48 to 72 hours before prescribing antibiotics. However, children younger than 6 months should receive immediate antibiotic treatment. Parents can give children 6 months and older ibuprofen or acetaminophen to help relieve pain. Antibiotics are not helpful for most cases of OME. Doctors usually monitor children with OME for 3 months to see if their condition improves. Some children with hearing loss and developmental problems may eventually need surgery. Inserting tubes into the ear drum (tympanostomy) is the usual surgery for this problem. , commonly called the eardrum. The middle ear is filled with air that surrounds a chain of three tiny bones. These bones vibrate to the rhythm of the eardrum and pass the sound waves on to the inner ear. The inner ear is filled with fluid. Here, hair-like structures stimulate nerves to change sound waves into electrochemical impulses that are carried to the brain, which senses these impulses as sounds. The inner ear also functions as the body's gyroscope, regulating balance. 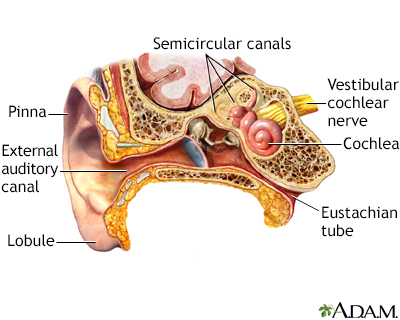 The Eustachian tube runs from the middle ear to the passages behind the nose and the upper part of the throat. This tube helps equalize the air pressure in the middle ear to the outside air pressure. Problems here are primary factors in most cases of ear infection. The ear consists of external, middle, and inner structures. The eardrum and the three tiny bones conduct sound from the eardrum to the cochlea. Middle ear infections are extremely common in children younger than 3. But they are infrequent in adults. AOM symptoms improve within 48 to 72 hours with or without antibiotic treatment in most children. There does not appear to be any risks for at least 2 to 3 days. Even after symptoms subside, fluid may persist in the middle ear for weeks to months after AOM onset. Fluid is present. But there is no infection. There is usually no pain. Sometimes the only clue that it is present is a feeling of stuffiness in the ears, which can feel like "being under water." Hearing may be temporarily impaired in children. But most children will not have long-term hearing loss. This condition refers to persistent perforation or hole in the tympanic membrane. It is called chronic suppurative otitis media when there is persistent pus-like drainage inflammation in the middle ear or mastoids (the rounded bone just behind the ear). There may also be a chronic rupture of the eardrum with either ongoing drainage that is not infected or a dry eardrum with a perforation but no drainage or infection. Other chronic changes may result from severe acute infections, recurrent infections, or a chronic infection. These changes include bone erosion, erosion and changes in the ossicular bones behind the eardrum, or scarring of the eardrum and middle ear compartment. These problems often lead to chronic hearing loss. Acute otitis externa is an inflammation or infection of the outer ear and ear canal. It can be triggered by water that gets trapped in the ear. The trapped water can cause bacteria and fungi to breed. Otitis externa can also be precipitated by overly aggressively scratching or cleaning of ears or when an object gets stuck in the ears. Otitis externa should be treated with topical antibiotics, which will cure the infection and help relieve pain. With eardrops, most cases will clear up within 2 to 3 days. If the condition persists, the doctor will need to evaluate and rule out other possible causes. Acute otitis media (middle ear infection) is usually due to a combination of factors that increase susceptibility to bacterial and viral infections in the middle ear. The primary setting for middle ear infections is in a child's Eustachian tube, which runs from the middle ear to the nose and upper throat. The Eustachian tube is shorter and narrower in children than adults, and more vulnerable to blockage. It is also more horizontal in younger children and therefore does not drain as well. Children with abnormally short and relatively horizontal Eustachian tubes are at particular risk for ear infections. Streptococcus pneumoniae (also called S. pneumoniae or pneumococcus) is the most common bacterial cause of acute otitis media, causing about 40% to 80% of cases in the U.S.
Haemophilus influenzae, the next most common bacterium, is responsible for 20% to 30% of acute infections. Since the introduction of the pneumococcal conjugate vaccine, the U.S. frequency of S. pneumoniae infections tended to decrease, while that of H. influenzae infections tended to increase. S. pneumoniae is still the leading microorganism to cause otitis media worldwide. Moraxella catarrhalis is responsible for 10% to 20% of infections. Other bacteria include Streptococcus pyogenes and (rarely) Staphylococcus aureus. Viruses play an important role in many ear infections, and can set the stage for bacterial infections. Rhinoviruses are the common viruses that cause colds. While rhinoviruses themselves do not cause ear infections, if a cold does occur the virus can cause the membranes along the walls of the inner ear passages to swell and obstruct the airways. If this inflammation blocks the narrow Eustachian tube, the middle ear may not drain properly. Fluid builds up and becomes a breeding ground for bacteria and subsequent infection. Other viruses, such as respiratory syncytial virus (RSV, a virus responsible for childhood respiratory infections) and influenza (flu), can be the actual causes of some ear infections. Nearly a third of infants and toddlers with upper respiratory infections go on to develop acute otitis media. Evidence suggests that both viruses and bacteria play a role in ear infections. Viruses can increase middle ear inflammation and interfere with antibiotics' effectiveness in treating bacterial causes of ear infections. HIV or other viruses that weaken the immune system can increase the risk for ear infections. Congenital structural abnormalities, such as cleft palate, increase the risk for ear infections. Genetic conditions, may also increase the risk. For example, in Kartagener's syndrome the cilia (hair-like structures) in the middle ear and Eustachian tube are immobile and cause fluid buildup. Children with Down syndrome or fetal alcohol syndrome may also be at increased risk due to anatomical abnormalities. In the United States, ear infections are the most common reason why children see the doctor. AOM generally affects children ages 6 to 18 months. The earlier a child has a first ear infection, the more likely they are to recurrent episodes. About two-thirds of children will have a least one attack of AOM by age 3, and a third of these children will have at least three episodes. Boys are more likely to have infections than girls. As children grow, the structures in their ears enlarge and their immune systems become stronger. By age 16 months, the risk for recurrent infections rapidly decreases. After age 5, most children outgrow their susceptibility to ear infections. OME is very common in children age 6 months to 4 years, with about 90% of children having OME at some point. More than half of children have OME by age 2. Upper respiratory infections (URIs) such as the common cold often precede and increase the risk for ear infections. Allergies do not cause ear infections. But they can cause inflammation and fluid buildup in the ears, which may contribute to ear infections. Although ear infections themselves are not contagious, Children who have close and frequent exposure to other children in group settings such as day care and preschool are at increased risk for catching colds and other upper respiratory infections. Having siblings with recurrent ear infections also increases risk. Exposure to second-hand cigarette smoke. Parents who smoke increase the risk that their children will develop middle ear infections. Babies who are bottle-fed, especially when lying down, may have a higher risk for otitis media than breastfed babies. The American Academy of Pediatrics recommends breastfeeding for at least the baby's first 6 months. Pacifiers may increase the risk for ear infections. Sucking increases production of saliva, which helps bacteria travel up the Eustachian tubes to the middle ear. Obesity may increase the risk for OME. Severe cases of recurrent acute otitis media (AOM) or persistent otitis media with effusion (OME) may impair hearing for a period of time. But the hearing loss is not substantial or permanent for most children. Hearing loss in children may temporarily slow down language development and reading skills. However, uncomplicated chronic middle ear effusion generally poses no danger for developmental delays in otherwise healthy children. Rarely, patients with chronic otitis media develop involvement of the inner ear. In these situations hearing loss can potentially be permanent. Most of these patients will also have problems with vertigo (dizziness). In some cases, the eardrum may rupture under the pressure from buildup of fluid. This can occur from both AOM and OME and usually heals without treatment. However chronic perforations require surgical treatment. Certain children with severe or recurrent otitis media may be at risk for structural damage in the ear, including erosion of the ear canal. Inflammatory tissues in the ear called cholesteatomas are an uncommon complication of chronic or severe ear infections. In rare cases, even after a mild infection, some children develop calcification and hardening in the middle and, occasionally, in the inner ear. This may be due to immune abnormalities. Before the introduction of antibiotics, mastoiditis (an infection in the bones located in the skull region behind the ears) was a serious, although rare, complication of otitis media. The condition is difficult to treat and requires intravenous antibiotics and drainage procedures. Surgery may be necessary. If pain and fever persist in spite of antibiotic treatment of otitis media, the doctor should check for mastoiditis. 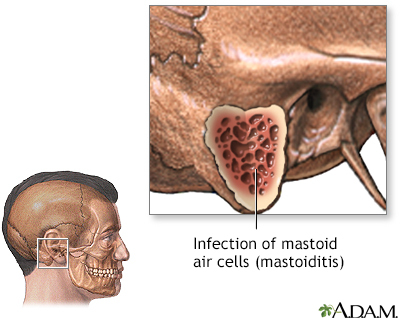 If an infection of the mastoid air cells cannot be controlled with antibiotics, surgery may be needed. If the infection spreads to the inner ear patients may experience vertigo, tinnitus, nausea, nystagmus, and hearing loss. Labyrinthitis most often occurs with chronic suppurative otitis media or cholesteatomas. In rare cases, bacteria from a severe ear infection can spread to the tissues surrounding the brain. Very rarely, a child with acute otitis media may develop facial paralysis, which is temporary and usually relieved by antibiotics or possibly drainage surgery. Facial paralysis may also occur in patients with chronic otitis media and a cholesteatoma (tissue in the middle ear). Surgery is usually needed to correct this condition. Ear pain is the most common symptom of ear infections. The ear pain associated with acute otitis media usually comes on very suddenly. If the ear infection is severe, the tympanic membrane may rupture, causing the pus to drain from the ear. (This usually brings relief from pain.) Pus in the ear may cause hearing loss in some children. OME may have no symptoms at all. Some hearing loss may occur, but it is often fluctuating and hard to detect. The only sign to a parent that the condition exists may be when a child complains of "plugged up" hearing. Other symptoms can include loud talking, not responding to verbal commands, and turning up the television or radio. Older children with OME may have difficulty targeting specific sounds in a noisy room. In such cases, some parents or teachers may attribute their behavior to lack of attention or even to an attention deficit disorder. Older children and adults may also notice a sense of fullness in the ear. OME is often diagnosed during a regular pediatric visit. Symptoms are not reliable in themselves for diagnosing ear infections. Ear pain, ear tugging, irritability, fussiness, and similar symptoms may be due to ear infections or they may be caused by unrelated health conditions (colds, other infections, teething). AOM (fluid and infection) is often difficult to differentiate from OME (fluid without infection). It is important for a doctor to make this distinction because OME does not require antibiotic treatment. This is why the new guidelines recommend that doctors use a pneumatic otoscope during the physical exam to get a clearer picture of the eardrum's appearance. Pneumatic otoscopy can detect how easily the eardrum moves in response to changes in pressure. If the eardrum does not move easily, this is a sign that there is fluid present. The otoscope is a flashlight-like instrument with a magnifying lens to help the doctor get a clear picture of the eardrum. The otoscope has a rubber bulb attachment that the doctor presses to push air into the ear. The doctor gently inserts the otoscope into the ear canal and presses the bulb to release a puff of air. By observing the action of the air against the eardrum, the doctor can evaluate the eardrum's movement. The procedure is very quick and is usually painless. An otoscope is a tool that shines a beam of light to help visualize and examine the condition of the ear canal and eardrum. Examining the ear can reveal the cause of symptoms such as an earache, the ear feeling full, or hearing loss. With tympanometry, a small probe is held to the entrance of the ear canal and forms an airtight seal. While the air pressure is varied, a sound with a fixed tone is directed at the eardrum and its energy is measured. Tympanometry can detect fluid in the middle air and also obstruction in the Eustachian tube. , also measures reflected sound. It can detect fluid and obstruction, but does not require an airtight seal at the canal. Neither tympanometry nor reflectometry are substitutes for the pneumatic otoscope, which allows a direct view of the middle ear. Parents can also use a sonar-like device, such as the EarCheck Monitor, to determine if there is fluid in their child's middle ear. EarCheck uses acoustic reflectometry technology, which bounces sound waves off the eardrum to assess mobility. When fluid is present behind the middle ear (a symptom of AOM and OME), the eardrum will not be as mobile. The device works like an ear thermometer and is painless. Results indicate the likelihood of the presence of fluid and may help patients decide whether they need to contact their child's doctor. On rare occasions the doctor may need to draw fluid from the ear using a needle for identifying specific bacteria, a procedure called tympanocentesis. This procedure can also relieve severe ear pain. It is most often performed by an ear, nose, and throat (ENT) specialist, and usually only in severe or recurrent cases. In most cases, tympanocentesis is not necessary in order to obtain an accurate enough diagnosis for effective treatment. Hearing tests performed by an audiologist are usually recommended for children with persistent otitis media with effusion. A hearing loss below 20 decibels usually indicates problems. At 4 to 6 weeks most babies with normal hearing make cooing sounds. By around 5 months, infants should be laughing out loud and making one-syllable sounds with both a vowel and consonant. Between 6 to 8 months, babies should be able to make word-like sounds with more than one syllable. Usually starting around 7 months, and by 10 months, babies babble (making many word-like noises). Around 10 months, babies can identify and use some term for a parent, such as dada, baba, or mama. Babies speak their first word usually by the end of their first year. If a child's progress is significantly delayed beyond these times, a parent should suspect possible hearing problems. The best way to prevent ear infections is to prevent colds and flu. The American Academy of Pediatricians recommends that all children receive the pneumococcal vaccine (PCV13) and an annual flu shot. The American Academy of Pediatrics (AAP) and the U.S. Centers for Disease Control (CDC) recommend annual influenza vaccination for all children over 6 months of age. Preventing the flu (influenza) is an important protective measure against ear infections. Flu vaccines are typically given by injection, usually between October and December. The earlier your child receives the vaccine, the earlier the immunity to the flu will take effect. It usually takes about 2 weeks for antibodies to the influenza virus to develop. These antibodies provide protection against the virus. A nasal spray form of the flu vaccine is approved for children ages 2 years and older. This intranasal vaccine is made from a live but weakened influenza virus (live attenuated influenza vaccine, LAIV); flu shots use inactivated (not live) viruses. Children younger than 2 years old, and children younger than age 5 who have asthma or recurrent wheezing, should not receive this intranasal vaccine. Side effects of the flu shot are generally mild but may include soreness at the injection site, low-grade fever, or body aches. These side effects usually go away on their own within a few days. Side effects of the nasal flu vaccine in children can include runny nose, wheezing, vomiting, muscle aches, and fever. The pneumococcal conjugate vaccine (PCV13) protects against 13 of the most important strains of S. pneumoniae that cause pneumococcal meningitis, pneumococcal pneumonia, and other respiratory infections. It also protects against many of the bacteria that cause middle ear infections. PCV13 is specifically approved to help prevent invasive pneumococcal disease and otitis media. The recommended schedule of pneumococcal immunization is four doses, one each given at 2, 4, 6, and 12 to 15 months of age. Cold and flu viruses spread when an infected person coughs or sneezes. These viruses can also be transmitted by shaking hands. Everyone should always wash their hands before eating and after going outside. Ordinary soap is sufficient. Waterless hand cleansers that contain an alcohol-based gel are also effective. Antibacterial soaps add little protection, particularly against viruses. Wiping surfaces with a solution that contains one part bleach to 10 parts water is very effective in killing viruses. Breastfeeding offers protection against many early infections, including ear infections. Mother's milk provides immune factors that help protect the child from infections. Also, infants are held during breastfeeding in a position that allows the Eustachian tubes to function well. If possible, new mothers should breastfeed their infants for at least 4 to 6 months. According to the American Academy of Pediatrics, exclusively breastfeeding for a baby's first 6 months helps to prevent ear and other respiratory infections. For improving protection for bottle-fed babies, do not lay the baby down with the bottle ("bottle propping"). Hold the infant in the same way you would to breastfeed. No one should smoke around children. Studies indicate that children who live with smokers have a significantly increased risk for ear infections. Most cases of AOM clear up on their own within a week and do not require antibiotic treatment. (Antibiotics are necessary for children with special health concerns, and infants younger than 6 months.) Doctors often recommend a "watchful waiting" period for the first 48 to 72 hours after symptoms appear, to see if ear pain and other symptoms resolve on their own. Children younger than 6 months of age should receive immediate antibiotic treatment. Children 6 months or older should be treated for pain within the first 24 hours with either acetaminophen (Tylenol, generic) or ibuprofen (Advil, generic). Pain relievers -- not antibiotics -- are the main drugs used for AOM treatment. For children, aged 6 months to 2 years old, antibiotic treatment is recommended for either severe symptoms or for non-severe symptoms that have not improved within 48 to 72 hours. Severe AOM symptoms include moderate to severe pain and a fever of at least 102.2°F (39°C). For children older than 2 years, and those with mild symptoms or infection only in one ear, watchful waiting is recommended. Preventive antibiotics are not recommended for recurrent acute otitis media. Ear tube (tympanostomy) insertion are an option for children who have had at least 3 occurrences of AOM in 6 months or 4 episodes in a year. However, newer guidelines strongly advise that tympanostomy tube surgery should be used only for children who have middle-ear effusion (fluid behind the eardrum) and not for children with frequent AOM infections. Parents can help reduce risks for ear infections by breastfeeding for the baby's first 6 months, avoiding bottle propping, avoiding exposure to second-hand tobacco smoke, and making sure their children receive vaccinations for pneumococcal disease and influenza. Otitis media with effusion (OME) is fluid behind the middle ear (eardrum). It usually resolves on its own without treatment, especially when it follows an acute ear infection. Antibiotics are not helpful for most cases of OME. The child is typically monitored for the first 3 months. (Most cases of OME resolve within 3 months.) If OME lasts longer than 3 months, a hearing test should be conducted. Even if OME lasts for longer than 3 months, the condition generally resolves on its own without any long-term effects on language or development. The doctor will re-evaluate the child at periodic intervals to determine if there is risk for hearing loss. Antibiotics, decongestants, antihistamines, and corticosteroids do not help and are not recommended for routine management of OME. Antibiotic ear drops are helpful for treating ear infections that may occur in children with tympanostomy tubes. Topical antibiotics (ear drops) work better than oral antibiotics (pills) for treating the discharge that can occur with this type of infection. Ear tube insertion may be recommended when fluid builds up behind your child's eardrum and does not go away after 3 months or longer. Fluid buildup may cause some hearing loss while it is present. However, most children do not have long-term damage to their hearing or their ability to speak even when the fluid remains for many months. OME in one or both ears for at least 3 months. Hearing difficulties and OME in both ears for at least 3 months. Symptoms caused by persistent OME (balance problems, poor school performance, behavioral issues, or reduced quality of life). OME and risk for developmental problems for conditions such as Down syndrome, autism, or cleft palate. Children who have persistent OME and do not receive tubes should be reevaluated every 3 to 6 months until the fluid is no longer present, hearing loss is detected, or structural damage is suspected. Insertion of tympanostomy tubes into the eardrum is the first choice for surgical intervention. Adenoidectomy (removal of adenoids) plus myringotomy (removal of fluid), with or without tube insertion, is sometimes recommended as a repeat surgical procedure. (Myringotomy alone is not recommended for OME treatment. Adenoidectomy is not recommended as an initial procedure unless some other condition (chronic sinusitis, nasal obstruction, adenoiditis) is present. Tonsillectomy (removal of tonsils) is not recommended for OME treatment. Parents can press a warm water bottle or warm bag of salt against the ear. Such old-fashioned remedies may help to ease ear pain. Due to the high risk of burns, ear candles should not be used to remove wax from ears. These candles are not safe or effective for treatment of ear infections or other ear conditions. Researchers are studying the protective value of probiotics ("good" bacteria) especially lactobacilli strains such as acidophilus. But it is important not to give your child any herbal remedies or dietary supplements without consulting with the pediatrician. Acetaminophen (Tylenol, generic) and ibuprofen (Advil, generic) are the main pain relievers recommended for children. Eardrops containing anesthetics are also available by prescription. They provide short-acting pain relief and may help children endure ear discomfort until an oral pain reliever takes effect. Parents should check with a doctor before using them. Eardrops could cause damage in children who have a ruptured eardrum. Note: Aspirin and aspirin-containing products are not recommended for children or adolescents. Reye syndrome, a very serious condition, is associated with aspirin use in children who have chickenpox or flu. Decongestants (pills or nasal sprays or drops), antihistamines, or combination products are not recommended for AOM or OME. Recent research has questioned the general safety of cough and cold products for children. They are currently banned for use in children under age 4 years. The American College of Chest Physicians recommends against the use of nonprescription cough and cold medicines in children age 14 years and younger. The child takes a deep breath and closes the mouth. The child then blows the nose gently while, at the same time, pinching it firmly shut. The parent should be sure to instruct the child not to blow too hard or the eardrum could be harmed. Do not use this technique if an infection is present. Children with ruptured acute otitis media (drainage from ear canal) should not go swimming until their infections are completely cured. Children with AOM that is not ruptured should not dive or swim underwater. Children with implanted ear tubes can usually safely swim, bathe, or engage in water sports without needing earplugs or other precautions. Pain relievers such as ibuprofen or acetaminophen are the main drug treatments used for ear infections. Doctors want to avoid prescribing antibiotics unless they are absolutely needed. Your child's doctor may recommend watchful waiting for the first 48 to 72 hours after symptoms appear, to see if ear pain and other symptoms resolve on their own. A 10-day course of antibiotics is usually recommended for children younger than 2 years of age, and for those with severe symptoms. A 7-day course is recommended for children 2 to 5 years of age with mild or moderate AOM. A 5 to 7 day course is recommended for children 6 years of age and older with mild-to-moderate symptoms. Parents should be sure their child finishes the entire course of therapy. Your child's symptoms, including fever, should improve within 48 to 72 hours after beginning antibiotics. If symptoms do not improve it may be because a virus is present or the bacteria causing the ear infection is resistant to the prescribed antibiotic. A different antibiotic may be needed. In some children whose treatment is successful, fluid will still remain in the middle ear for weeks or months, even after the infection has resolved. During that period, children may have some hearing problems, but eventually the fluid almost always drains away. If your child fails to improve and middle ear fluid remains, your doctor may recommend consultation with an ear, nose, and throat specialist (otolaryngologist). This specialist may perform a tympanocentesis procedure in which fluid is drawn from the ear and examined for specific bacterial organisms. But this is reserved for severe cases. Amoxicillin, a penicillin type of antibiotic, is generally recommended for first-line treatment of AOM. The combination drug amoxicillin-clavulanate is an alternative option. Children who are allergic to penicillin drugs will be prescribed a different antibiotic. Children who do not respond within 48 to 72 hours to initial treatment with amoxicillin may be given a course of amoxicillin-clavulanate or ceftriaxone. Alternative treatments are ceftriaxone or clindamycin, which may also be accompanied by a different cephalosporin antibiotic. The most common side effects of nearly all antibiotics are gastrointestinal problems, including cramps, nausea, vomiting, and diarrhea. Allergic reactions can occur with all antibiotics, but are especially common with penicillin drugs. These reactions can range from mild skin rashes to rare but severe, even life-threatening, anaphylactic shock. Some drugs, including certain over-the-counter medications, interact with antibiotics. Parents should tell the doctor about all medications their child is taking. Tympanostomy surgery involves the insertion of a tiny tube to prevent fluid from building up in the middle ear. These ear tubes (also called tympanostomy tubes) allow air to flow into the middle ear and help prevent infections caused by fluid accumulation. A general anesthetic (asleep, no pain) is given first. Children typically recover completely within a few hours. Myringotomy (removal of fluid) is performed next. After myringotomy, the doctor inserts a tube to allow continuous drainage of the fluid from the middle ear. Click the icon to see an images of an ear tube insertion. Tympanostomy is a simple procedure, and the child almost never has to spend the night in the hospital. Acetaminophen (Tylenol, generic) or ibuprofen (Advil, generic) is sufficient for any postoperative pain in most children. However, some children may need codeine or other powerful pain relievers. Generally, the tubes stay in the eardrum for 6 to 12 months before coming out on their own. Less commonly, long-term tubes are implanted that need to be surgically removed. Children with ear tubes can usually swim and bathe normally, and do not need to wear earplugs. Otorrhea, drainage of secretion from the ear, is the most common complication after surgery and can be persistent in some children. This discharge can be treated with antibiotic eardrops. General anesthetic risks. Rarely, allergic reactions or other complications, such as throat spasm or obstruction, may occur. The risk is highest in children who have other medical conditions, most commonly upper respiratory infections, lung disease, or gastroesophageal reflux disorder (GERD). Anesthetic-related risks are nearly always easily treated. Tube blockage. Sometimes the tubes become blocked from sticky secretions or clotted blood after the operation. 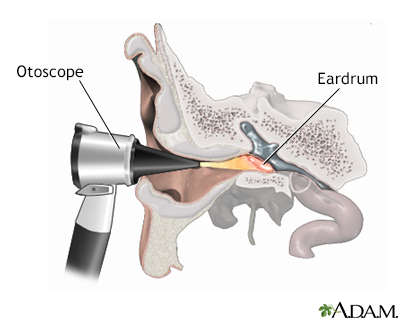 Eardrum perforation. This condition occurs when the eardrum does not close after the tubes have come out. It is the most common serious complication, but it is very rare. Scarring can also occur, particularly in children who need more than one procedure. But it almost never affects hearing. Cholesteatomas, small cyst-like masses filled with keratin (skin cells), develop around the tube site in about 1% of patients. Hearing is almost always restored following tympanostomy. Failure to achieve normal or near-normal hearing is usually due to complicated conditions, such as preexisting ear problems or persistent OME in children who have had previous multiple tympanostomies. Persistent fluid is the main reason for continued impaired hearing. Only a small percentage of hearing loss cases can be attributed to complications of the operation itself. Eventually, the tubes fall out as the hole in the eardrum closes. This may happen after several months or more than a year later. It is painless. In fact, the patient and parents may not even be aware that the tubes are out. About 20% to 50% of children may have OME relapse and need additional surgery that involves adenoidectomy and myringotomy. Tube reinsertion may be recommended for children younger than 4 years of age. The surgeon makes a very small incision in the eardrum. Fluid is sucked out using a vacuum-like device. The fluid is usually examined for identifying specific bacteria. The eardrum heals in about a week. 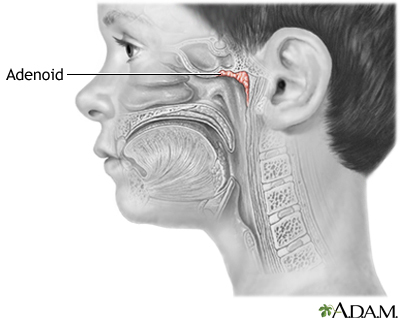 Adenoids are collections of spongy lymph tissue in the back of the throat, similar to the tonsils. Removal of the adenoids, called adenoidectomy, is usually considered only for OME if a pre-existing condition exists, such as chronic sinusitis, nasal obstruction, or chronic adenoiditis (inflammation of the adenoids). Unless these conditions exist, adenoidectomy is not recommended for treatment of OME. Adenoidectomy plus myringotomy (removal of fluid) may be performed if an initial tympanostomy (tube insertion) procedure is unsuccessful in resolving OME. This combination procedure works best in children ages 4 years or older. Tube insertion alone is recommended for children under 4 years of age. It is not necessary to perform an adenoidectomy along with tube insertion for children under 4 years of age. Laser-assisted myringotomy is a technique that is being investigated as an alternative to conventional tympanostomy and myringotomy. At present, there is not enough evidence to say whether it is as good as ear tubes, the standard procedure. Some clinical trials have suggested that the success rate for laser-assisted myringotomy is half that of standard tympanostomy/myringotomy. Casselbrandt ML, Mandel EM. Acute otitis media and otitis media with effusion. In: Flint PW, Haughey BH, Lund V, et al, eds. Cummings Otolaryngology. 6th ed. Philadelphia, PA: Elsevier Saunders; 2015:chap 195. Chole RA. Chronic otitis media, mastoiditis, and petrositis. In: Flint PW, Haughey BH, Lund V, et al, eds. Cummings Otolaryngology. 6th ed. Philadelphia, PA: Elsevier Saunders; 2015:chap 139. Gulani A, Sachdev HS. Zinc supplements for preventing otitis media. Cochrane Database Syst Rev. 2014;29(6):CD006639. PMID: 24974096 www.ncbi.nlm.nih.gov/pubmed/24974096. Harris AS, Elhassan HA, Flook EP. Why are ototopical aminoglycosides still first-line therapy for chronic suppurative otitis media? A systematic review and discussion of aminoglycosides versus quinolones. J Laryngol Otol. 2016;130(1):2-7. PMID: 26584651 www.ncbi.nlm.nih.gov/pubmed/26584651. Klein JO. Otitis externa, otitis media, and mastoiditis. Bennett JE, Dolin R, Blaser MJ, eds. Mandell, Douglas, and Bennett's Principles and Practice of Infectious Diseases, Updated Edition. 8th ed. Philadelphia, PA: Elsevier Saunders; 2015:chap 62. Kerschner JE, Preciado D. Otitis Media. In: Kliegman RM, Stanton BF, St Geme JW, Schor NF, eds. Nelson Textbook of Pediatrics. 20th ed. Philadelphia, PA: Elsevier; 2016:chap 640. Mittal R, Parrish JM, Soni M, Mittal J, Mathee K. Microbial otitis media: recent advancements in treatment, current challenges and opportunities. J Med Microbiol. 2018;67(10):1417-1425. PMID: 30084766 www.ncbi.nlm.nih.gov/pubmed/30084766. Rosenfeld RM, Shin JJ, Schwartz SR, et al. Clinical practice guideline: otitis media with effusion executive summary (Update). Otolaryngol Head Neck Surg. 2016;154(2):201-214. PMID: 26833645 www.ncbi.nlm.nih.gov/pubmed/26833645. Siddiq S, Grainger J. The diagnosis and management of acute otitis media: American Academy of Pediatrics Guidelines 2013. Arch Dis Child Educ Pract Ed. 2015;100(4):193-197. PMID: 25395494 www.ncbi.nlm.nih.gov/pubmed/25395494. Szmuilowicz J, Young R. Infections of the ear. Emerg Med Clin North Am. 2019;37(1):1-9. PMID: 30454772 www.ncbi.nlm.nih.gov/pubmed/30454772. Steele DW, Adam GP, Di M, Halladay CW, Balk EM, Trikalinos TA. Prevention and treatment of tympanostomy tube otorrhea: a meta-analysis. Pediatrics. 2017;139(6). pii: e20170667. PMID: 28562289 www.ncbi.nlm.nih.gov/pubmed/28562289. Tapiainen T, Kujala T, Renko M, et al. Effect of antimicrobial treatment of acute otitis media on the daily disappearance of middle ear effusion: a placebo-controlled trial. JAMA Pediatr. 2014;168(7):635-641. PMID: 24797294 www.ncbi.nlm.nih.gov/pubmed/24797294. van Dongen TM, van der Heijden GJ, Venekamp RP, Rovers MM, Schilder AG. A trial of treatment for acute otorrhea in children with tympanostomy tubes. N Engl J Med. 2014;370(8):723-733. PMID: 24552319 www.ncbi.nlm.nih.gov/pubmed/24552319. Venekamp RP, Burton MJ, van Dongen TM, van der Heijden GJ, van Zon A, Schilder AG. Antibiotics for otitis media with effusion in children. Cochrane Database Syst Rev. 2016;(6):CD009163. PMID: 27290722 www.ncbi.nlm.nih.gov/pubmed/27290722. Venekamp RP, Damoiseaux RA, Schilder AG. Acute otitis media in children. Am Fam Physician. 2017;95(2):109-110. PMID: 28084706 www.ncbi.nlm.nih.gov/pubmed/28084706. Venekamp RP, Sanders SL, Glasziou PP, Del Mar CB, Rovers MM. Antibiotics for acute otitis media in children. Cochrane Database Syst Rev. 2015;(6):CD000219. PMID: 26099233 www.ncbi.nlm.nih.gov/pubmed/26099233.